Should We Accept TPP’s Harm For National Security Reasons? Calling the Trans-Pacific Partnership (TPP) a “trade” deal (it isn’t) the corporate community and the Obama administration are also trying to sell it as important for national security. Recent op-eds make a strong case that this is just wrong. While I respect President Obama and the pact’s military backers, I believe these arguments miss a crucial point: By facilitating the further offshoring of America’s manufacturing base, the trade pact would actually undermine America’s military readiness and global economic standing. TPP would hurt our national security interests more than it would help. I’ve seen these offshoring risks firsthand. Writing that “TPP would vastly expand the rights of multinational firms that do not necessarily represent America’s national interests,” Adams goes on to make a solid case for retaining industrial capacity and supply chains in the US. He also notes the domestic damage done by our country’s current deindustrialization trade policies. Please click through and read the rest. … [T]he White House is gearing up for one last, desperate push to get the deal through Congress. The pitch, which will begin in a few weeks, will rely on what President Obama thinks is his ace in the hole: the argument that, regardless of its economic merits, the deal, as a counter to China’s rising influence, is essential to America’s national security. The Seventh Fleet has been patrolling the waters of East and Southeast Asia since World War II, and America has had at least 100,000 troops based in Asia for just as long. And, trade deals or not, America had enormous, chronic trade deficits with most countries in the region, guaranteeing economic and political engagement for decades to come. If the combination of the American military presence and their trade surpluses with the United States weren’t enough to mollify Asian leaders, no free trade deal would significantly change the situation. … The president often speaks of the TPP as a tool that will prevent China from writing the rules of trade for the future. But even as we negotiate the TPP, China is negotiating its Regional Comprehensive Economic Partnership with all the Asia-Pacific TPP countries, as well as South Korea, the Philippines, Cambodia, Laos, Thailand, Indonesia, Myanmar and India. That deal may not be as sophisticated or comprehensive as the TPP, but that isn’t preventing all the Asia-Pacific countries from rushing to sign up, just as they have for China’s new Asian Infrastructure Investment Bank. It’s already clear that the TPP is not going to stop China from writing some of the future rules of world trade. … [T]he administration is absolutely right that America needs tools to counter China’s growing influence in Asia and around the world. But until America can come close to matching China’s dynamism, it has no hope of countering its economic and geopolitical influence with old-fashioned trade agreements, no matter how monumental they are said to be. Given the modesty of net benefits and the large, regressive redistribution of income created by growing trade flows, it is puzzling why TPP is such a priority for the Obama administration—especially when it, like trade agreements before, is quite likely to do disproportionate harm to the people who make up his and his party’s political base. 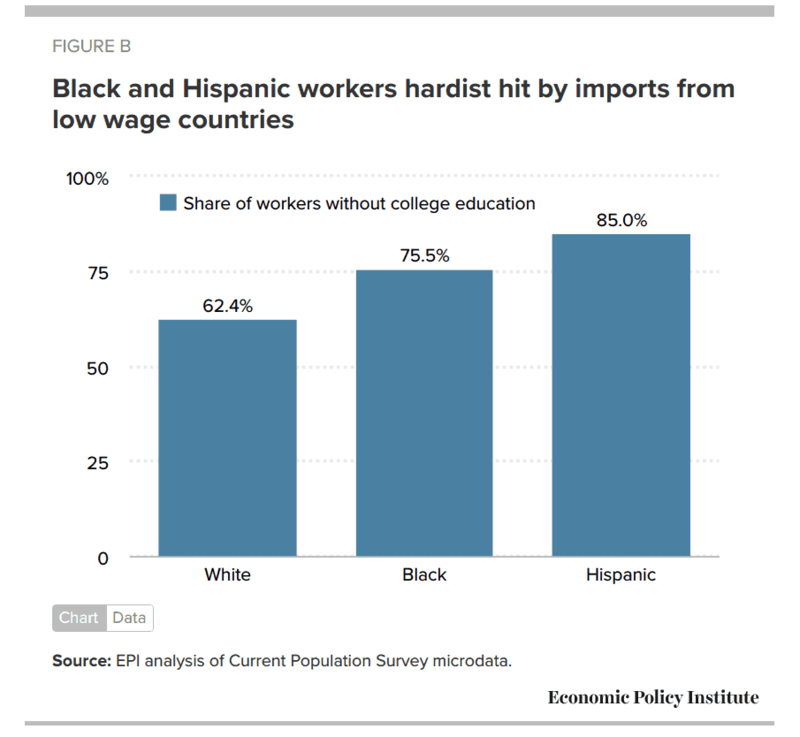 Even more puzzling is why there are no measures accompanying the TPP that would provide compensation for workers on the losing end (who are, again, disproportionately black and, Hispanic) at anything like the scale of the losses they will incur as a result of this terribly designed trade and investment deal. Scott concludes by asking how this makes sense politically. Approval of the TPP will likely depend to a large degree on the support of lame duck members of Congress, who are retiring or will be voted out of office in November, and thus have nothing to lose. If Clinton wins, and the Democrats regain control of the Senate, then the fate of this fundamentally flawed piece of Mr. Obama’s legacy could well be determined by his alliance with politicians who opposed every progressive step he took in his eight years in office, especially in the Senate. It would be a terrible irony if Mr. Obama’s last official legislative act is to sign the TPP, a huge give-away to multinational corporations. Surely, he can and should do better. The economic case for TPP makes no sense. It will only increase the export of our jobs, wages and ability make a living — and to protect our country. A so-called “trade” agreement designed to get national borders out of the way of corporations makes no sense to any concept of “national” security.